November 20, 2004 two volunteers from Stophate 2000 attended an Edmonton memorial service for members of the Transgender/Transsexual community who were murdered. The front of the church had a quilt filled with the names of Transgendered and Transsexual people who were murdered. 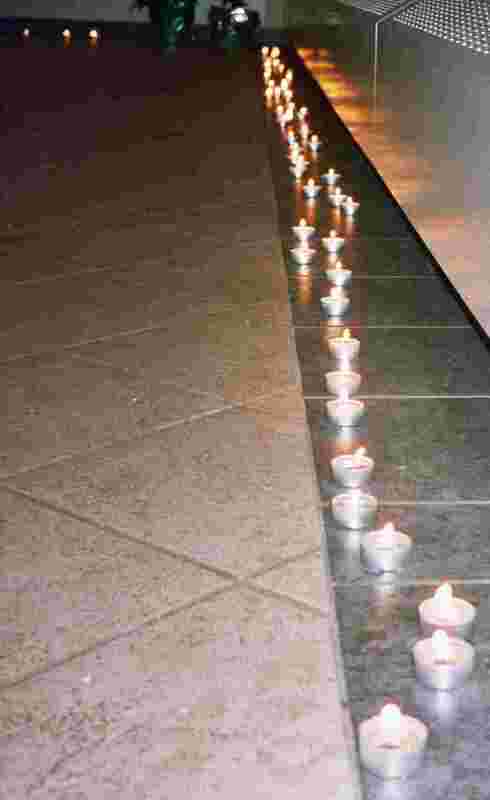 A long line of candles ringed the sanctuary. The service was powerful. The names of people who lost their lives and how they died were read. The serious nature of hate crimes aimed at Transgender/Transsexual individuals became very obvious during the service. The level of brutality of the murders of some Trans people is sickening. One victim was shot ten times, another stabbed 120 times, one trans hate victim was beaten, strangled, stabbed and burned, another victim was stabbed, dismembered, and burned. The web site Remembering Our Dead gives some of the stark realities of transphobic murders. Stophate 2000 would like to thank the sponsors of the Edmonton Transgender Day of Rememberance, 2004 for the memorial service. The sponsors include True Spirit North, Lambda Christian Community Church, Garneau United Church, Edmonton Small Press Association, Fresh Magazine and VUE Weekly. More photographs of the memorial service can be found by clicking on the candle image. Anybody wanting Stop Transphobia to create a memorial web page for a victim of transphobia is welcome to email us. People wanting us to link to their web memorial for a victim of transphobia are also encouraged to email us.